In honor of tradition, I made a really fun dessert for Brendan’s birthday again this year. Last year, I made him Bacon Chocolate Chip cookies. (Check out the recipe, here!) So, this year I decided to continue with the bacon theme, but throw a few other favorites of his in the mix. If you had Brendan make a list of his top 5 things to eat or drink bacon, pumpkin, cheese, and beer would probably be on that list. So, I put them all together in one little cupcake and they were pretty tasty, if I do say so myself! 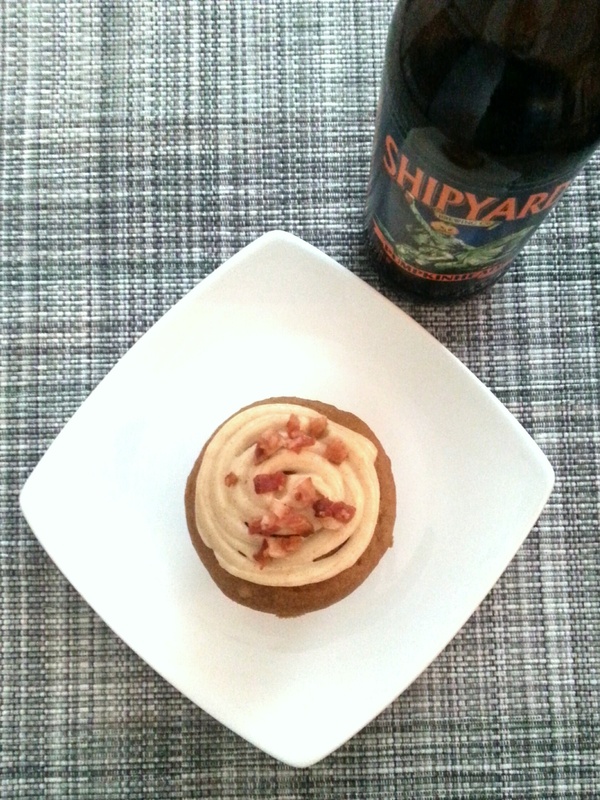 Here’s how to make these Pumpkin Beer Cupcakes with Maple Cinnamon Cream Cheese Frosting and Candied Bacon! Start by placing the bacon slices on a cold baking sheet, sprinkle with brown sugar evenly, and place in cold oven. Turn oven on to 350 degrees and check back in 15 minutes. You want the bacon to be crispy, but not charred, so remove when they’re the perfect, sizzling crispness and cool. When bacon is cooled, chop into small pieces to sprinkle on top of the frosting at the end. Now for the cupcakes. The oven is already preheated to 350 from the bacon, so all you need to prep is putting the cupcake liners in the tin. Then, in a mixing bowl, combine flour, baking soda, baking powder, pumpkin pie spice and salt, set aside. In a non stick frying pan, melt butter over low heat until slightly browned. In a mixing bowl, combine browned butter with granulated and brown sugars, whisk together until combined. Add eggs, pumpkin and beer to the butter sugar mixture and fold together with a spatula. Then slowly fold in the dry ingredients. Using a tablespoon, spoon batter into cupcake tins evenly and don’t over-fill! Bake for 10-15 minutes, or until toothpick inserted comes out clean, then cool. Meanwhile, you can prepare your frosting by beating together cream cheese, cinnamon, maple syrup and butter until well combined. Slowly beat in powdered sugar until desired sweetness and consistency. 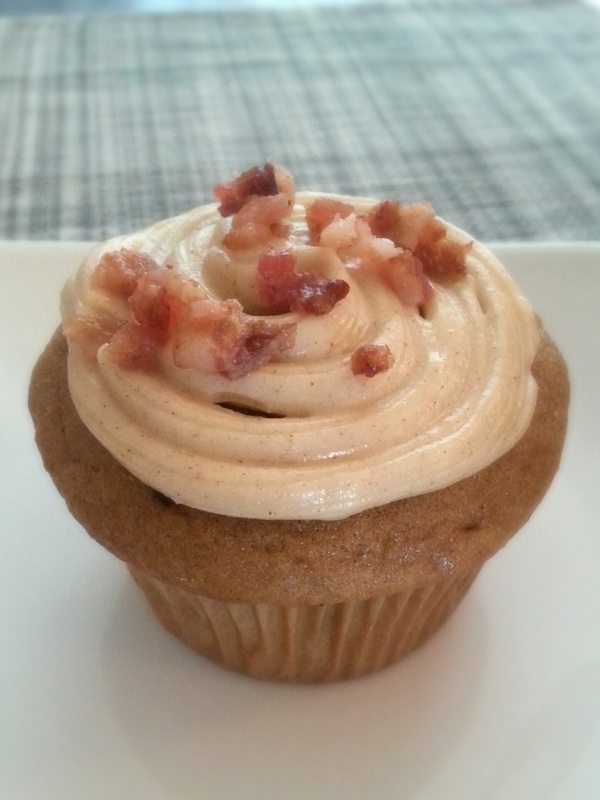 Once cupcakes are cooled, frost and top with candied bacon bits, and enjoy! I hope you enjoy these as much as we did! I’m so glad you posted the recipe, I wanna try it!! !